Here it is! 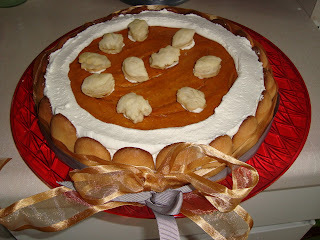 Here's my Thanksgiving Pumpkin-Cheesecake Charlotte in all its glory! It was a hit! I got lots of compliments. I had to "fake" a crust because when I pulled out the graham cracker crumbs from the back of my baking cupboard there were bugs in it. Gross. Good thing I keep everything else sealed in glass jars. I should have done the same for the crumbs. Live and learn, I guess. Anyway because of that I crumbled up cappuccino cookies we got from Ikea (good! ), oreo thins (those 100 calorie pack ones), and a pack of lady fingers. It worked pretty well. 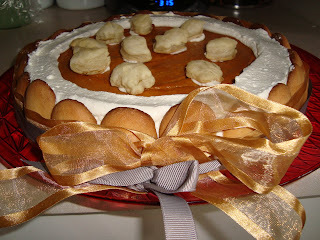 Also, John's mom got me pie cutters from Williams-Sonoma so I cut out some puff pastry and put it on the top. They're shaped as 3 leaves and an acorn. Darling. I made some healthy apple bran muffins today for my friend's birthday. He and his fiance are on a more health-concious diet these days as they prepare for their upcoming wedding in Jamaica! So to avoid their wrath for bringing sugary crap I made some healthy ones and made them smaller too so that they're portion controlled. I'll post the recipe tomorrow maybe.